An integral part of the company’s strategic growth plan, P&O Ferrymasters has undertaken a multi-million investment of 240 new swap body freight containers to further extend its pan-European intermodal logistics network. 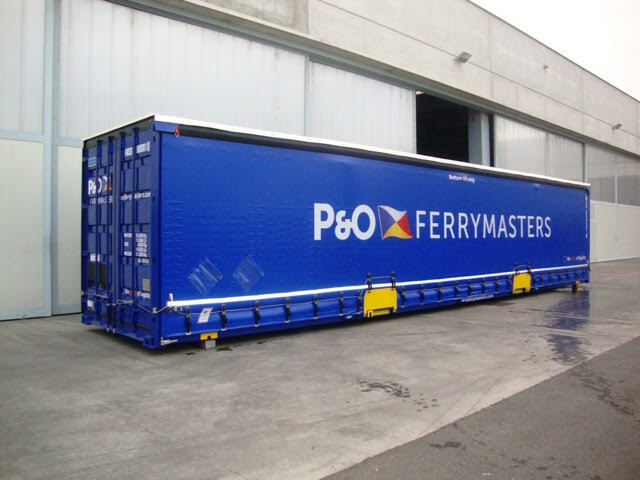 The 45’ curtainside units, which are one of the most sustainable methods of carrying freight, are the first of their kind in the P&O Ferrymasters fleet and will be used to transport goods by both rail and road. The design of swap bodies minimises empty weight, thereby cutting fuel consumption and carbon emissions because there is less dead weight to carry. “Our customers will benefit from the flexibility of these multi-purpose load units, with the swap bodies being deployed on our routes in Poland, Italy and Spain from this month,” explained Wim Blomme, P&O Ferrymasters’ Intermodal Director. “The major advantage of the swap bodies is that goods can be loaded and unloaded from the side and top. They are equipped with sliding curtains, a sliding roof and solid rear doors to allow easy access via the open side, top and rear,” he added. The swap bodies have been purchased from Italian manufacturer Centro Costruzioni Furgonature Containers S.r.I. Customers expected to utilise the units are drawn from a wide variety of sectors including chemicals, steel, paper and packaging, automotive, retail and consumer goods. P&O Ferrymasters is a division of P&O Ferries, which sails on eight major routes between Britain, France, Northern Ireland, the Republic of Ireland, Holland and Belgium. It operates more than 20 vessels which carry 8.4 million passengers and 2.3 million freight units annually.